The Top End Pro BB is designed for aspiring athletes who want durability and quick, easy adjustments all at a great price. Adjustments that can take up to 4 hours in other chairs, take only 15 minutes in the new Pro. Plus, it is so easy to order that you only need to measure seat width and depth, select a wheel size using our wheel guide and pick a color. Now that is easy! 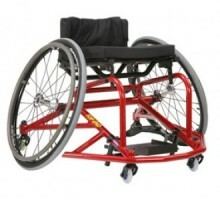 The new Top End Pro is available in both a tall and short frame to accommodate any aspiring athlete. This chair features a fully welded aluminum base frame with fixed camber which gives it the same stiffness and durability as our elite Top End Schulte BB chair and includes high performance sports wheels, high pressure clincher tires, quick release axles, adjustable height fixed swivel ant-tip with a 58mm fifth wheel and our smart fork caster system equipped with super hard 72mm front casters. But what sets this chair apart from every basketball chair out there is the super quick adjustability. You can adjust it between games or at half time with our exclusive quick release rear seat height adjustment system. This chair also has adjustable front seat height, center of gravity, back height/angle, back upholstery and footrest positioning: fore/aft, up/down, angle. Everyone is buzzing about the new adjustable platform footrest that delivers the perfect foot position whether you like to tuck them way back or not plus it has a toe stop and strap to secure your feet. Need one more advantage: our welded 4 bend wing will help you get that fast break and up your game! Seat Width 12" - 20"
Seat Depth 12" - 18"
Seat-to-Floor Height 13" - 21"
Overall Width 20" - 28"
Rear Wheel Size 22" - 26"
Back Height 9" - 18"
Click the button below to add the Invacare Top End Pro BB Basketball Wheelchair to your wish list.